Are you dreading the approaching cooler weather and the prospect of higher utility bills?Taking proactive action now to make your home more energy efficient is one way to take charge and lift your spirits. October is historically Energy Action Month! Why is energy efficiency important? While energy efficiency will help your household directly by lowering your utility bills, it also helps our nation by reducing the amount of energy that needs to be produced. This can lead to fewer fossil fuel power plants, cleaner air, and lower planet-warming greenhouse gas emissions. Plus, it creates jobs. Did you know that energy efficiency work has created 67,061 jobs in Maryland, and 2.2 million jobs across the U.S.? A best first step is to get a Potomac Edison no-cost Quick Home Energy Check-up, or better yet, a reduced cost $100 Home Performance with Energy Star (HPwES) Audit. 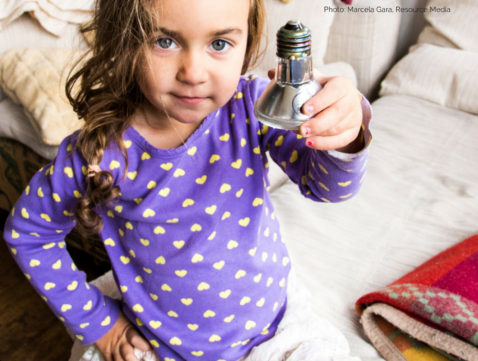 You'll receive up to 14 LED light bulbs plus getting a HPwES audit makes you eligible for a 75% rebate (up to $7,500) on recommended energy saving home improvements! Do you prefer to DIY? If so, Rule Your Attic! This web page shows you to find out whether or not your home has adequate insulation. If you don't, the site provides a series of very short how-to videos on sealing and insulating your attic. One of the most important places to air seal and insulate is your attic access point. Here's how to seal and insulate drop-down attic stairs, an attic hatch, or an attic door. Take Frederick County's Power Saver Challenge. This online tool guides and informs you step-by-step through a wide variety of energy-saving behaviors and actions. The "Read more" links connect you to how-to videos, additional resources, and financial incentives. You'll earn points and medals along the way and be able to see estimates of how your actions turn into beneficial savings including utility bill, water, gasoline, and carbon emissions savings. Many actions are "Renter-Friendly" too! More information is available at Energy.gov's Energy Efficiency webpage. You can try out their Appliance Energy Calculator, check out their detailed instructions for Do-It-Yourself Energy Saving Projects, and review Tips for Renters and Property Owners. Are you smarter than a 5thgrader? Here are a few energy quizzes that can raise your awareness about energy locally and globally: Energy Kids Quiz; Energy Awareness Quiz; ExxonMobil Energy Quizzes. Follow us on Facebook, Twitter , and Instagram for more energy tips throughout Energy Action Month. On June 29, 2017, County Executive Jan Gardner announced plans to re-energize Frederick County's sustainability efforts. The county's Office of Sustainability and Environmental Resources will return to its original mission to reduce energy costs and protect resources to preserve the quality of life for future generations. "We need to build a sustainable foundation for our region's prosperity, health and vitality to ensure the county's bright future," said Executive Gardner. "We can make Frederick County a leader to save green by going green." Frederick County Joins STAR Communities! STAR is a nonprofit whose mission is to "evaluate, improve, and certify" communities to "achieve a healthy environment, a strong economy, and well-being for their residents." STAR's Executive Director is Hilari Varnadore, who previously held the position of Director of the Office of Sustainability and Environmental Resources with Frederick County Government. County Executive Jan Gardner recently sat down with Hilari to discuss STAR and how it can help the County to measure its performance in key areas. Hilari shared STAR's "Leading Indicators" project, which is a set of 21 metrics for communities to measure, set goals with, and benchmark against other STAR participants. These indicators include drinking water quality, housing and transportation costs, renewable energy electricity supply, total solid waste, and high school graduation rate. The performance indicators are part of a community rating system that can lead to STAR certification. According to Hilari, “the rating system was built to help local leaders to determine ‘are our actions moving the needle on change in outcomes or conditions?” and that this translates to quality of life for citizens as well as community sustainability. Executive Gardner said that she thinks “STAR Communities will help us to track our metrics and our goals across all of our county agencies, so we’re very excited to be able to get involved and become certified in STAR Communities.” Stay tuned as we work on this exciting project!